The second-generation GMC Acadia is 700 pounds trimmer than its predecessor. Ten years is a long time for a vehicle to remain on the market without a clean sheet redesign. 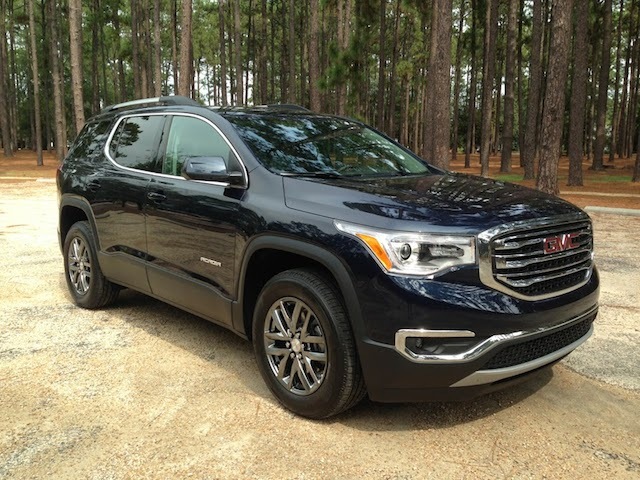 Introduced in 2007 and continuing through 2016, the first-generation GMC Acadia managed to stay relevant throughout its 10-year run, benefitting from numerous styling and technology updates along the way. For 2017, an all-new GMC Acadia arrives, a model coming in shorter, lighter, and more efficient than the previous generation. Downsizing in a market where gas prices are low and customers are clamoring for bigger and better seems like a risky move. Indeed, with its overall length shortened by seven inches and the width narrowed by three inches, this three-row SUV flies in the face of the current convention. To that end, we’ll examine the important “numbers” defining this model. 2.5 — For the first time the GMC Acadia offers a four-cylinder engine, this one displacing at 2.5 liters. Its joins the long-present 3.6-liter, V-6. The smaller engine makes 194 horsepower and 190 foot-pounds of torque and is EPA-rated at 21 mpg in the city and 26 mpg on the highway. That’s an improvement over the V6’s 18 mpg in the city and 25 mpg on the highway rating, but it comes at some cost. Indeed, if performance and pulling power are your thing, then the 310 horsepower and 271 foot-pounds of torque from the larger engine means “2.5” is a number you’ll want to pass up. 7 — Depending on how your 2017 Acadia is configured, you can seat five, six, or seven people. Most models are equipped with a third-row seat, a 50-50 split bench that folds flat into the floor. Access to that seat is possible by sliding and tilting the second row seat forward, even with a car seat present. Fold both the second and third rows and you’re left with 79 cubic feet of cargo space. With a 2+3+2 layout, this SUV seats 7. 11 — Eleven is the number of new or improved active safety features available with this all-new SUV. Forward collision alert returns and is joined by the following new or improved features: front pedestrian braking, low-speed forward automatic braking, forward automatic braking, following distance indicator, and automatic headlamps. You also get a surround vision camera system, a safety alert seat, lane keep assist with lane departure warning, lane change alert with side blind zone alert, and front and rear parking assist. 3,956 — Not only is the 2017 GMC Acadia shorter, narrower, and sits lower to the ground, but it is also 700 pounds lighter than the previous model. Some of that light weighting has to do with the smaller, base engine. But an overall lighter structure was achieved by incorporating press-hardened, high-strength steels, making for a more rigid SUV with improved crashworthiness. Tipping the scales at 3,956 pounds, the 2017 Acadia is downright svelte. 4,000 — When outfitted with the V-6 and the trailering package, the 2017 Acadia can pull 4,000 pounds. This may be the most disconcerting number, especially when compared with the 5,200 pounds trailering capacity of the previous model. Further, other models in this class perform much better, including the Dodge Durango at 6,200 pounds. Even the Nissan Pathfinder, Toyota Highlander, and Honda Pilot each have a 5,000-pound maximum towing capacity. If you want better trailering capabilities and would like to stay with GMC, then the Yukon will have to do. 29,995 — With a starting price of $29,995, the 2017 Acadia comes in $1,905 lower than the base price for the 2016 Acadia. Add $925 to cover destination costs. The latest model comes with a longer list of standard features including the latest version of GMC IntelliLink, now compatible with Apple CarPlay and Android Auto. In all, the 2017 Acadia offers eight trim levels, including an All Terrain model outfitted with an advanced all-wheel drive system with active twin clutch. 100,000 — In 2015, GMC sold 96,393 units of the Acadia, the most ever. What’s amazing about this number is that it came in the ninth year of the SUV’s product run. Typically, sales begin to fall after the fourth or fifth year. Acadia sales are down 12.2 percent through the first four months of 2016 on 25,575 units sold. Although 2016 doesn’t look like the year the Acadia will crack the 100,000-unit sold threshold, its entirely possible we’ll see that number breached next year. GMC is well positioned to handle the consumer shift to pickup trucks and SUVs. These are the only two lines of vehicles this brand sells and it does so with a premium edge. Given that most GMC and Buick showrooms are under one roof, a family of cars and other SUVs is available. Indeed, if customers want more SUV than what the Acadia offers, the similar Buick Enclave is still in its first generation. With the Buick you get the same V-6 engine paired with a 6-speed automatic transmission, but you’ll also have the 5,200 pounds of pulling power found in the first-generation Acadia. Photos copyright the General Motors Company.